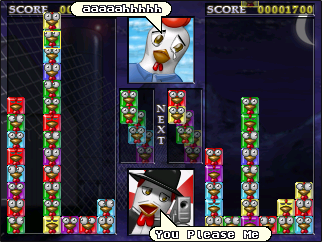 The original PSP Puzzle Game 'PolloPollo' comes now for Open Pandora. - 1P & 2P mode (in the same console). 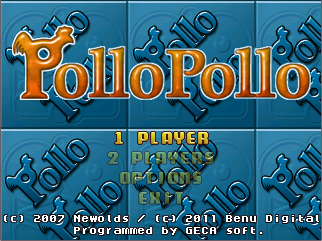 - G.M: Story Mode 1P/1P VS 2P/1P VS CPU/1P PolloMania (unlockable). - 3 independent Game mode Hiscore Tables. 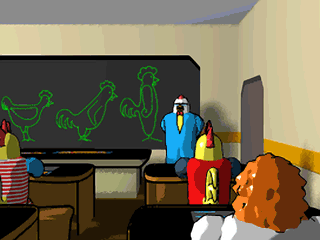 - Graphics, music, voice and video FX completely original, created exclusively for this game. IMPORTANT: This new update don't use DRM. Please don't share your copy, to help the creation of new (free and comercial) games possible in this great console. If you want the game covers in PDF format (to build a physical pandora game box) send an email to geca_portugal@yahoo.com requesting the covers. Thanks. 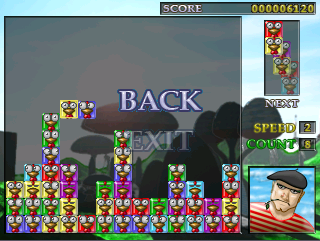 is this like tetris attack or something else? Also, how do you get rid of the clear blocks? Typically if you explode 4 of a kind in a game such as this near such a block they would disappear but that doesn't happen in this game. I was just wondering, typically if you make a connection of 4 in a game such as this when the blocks fall it will make a combo if another 4 blocks of the same color touch but this doesn't happen... is that a glitch or just part of your game design? Just bought pretty cool! Little disapointed its not full screen (like psp) and right shoulder kills with no warning and a couple other minor issues.